In the late 1970s, a man with an unexplained high hemoglobin level (Hb) was referred to Namsos Hospital north of Trondheim, Norway. It turned out that four members of his family had the same condition. Doctor Kjell Kanelønning was the physician who treated the family. He examined the man and his family members thoroughly without finding the cause of their condition. "Normal Hb values are between 12.5 and 17 (grams of hemoglobin per 100 ml of blood), whereas people with this condition have Hb values around 20. These are values that are way over the doping limit," says Anders Waage. Waage is a professor in the Department of Clinical and Molecular Medicine at the Norwegian University of Science and Technology (NTNU). Wage, who is also a medical doctor, entered the story in the early 1990s, when he began seeing the family in question at St. Olavs Hospital. The affected family members were neither doped up nor sick. Half of the family had simply been born with the condition. More researchers became interested in the case, including Bernt Ly at the Oslo University Hospital, and in 1983 he and Kanelønning and others wrote a scientific article about the phenomenon. "Today, we can see that all the leads they followed then were dead ends," said Waage, "but at the time, they weren't able to check anything else. The relevant methods simply didn't exist." Time passed, and Anders Waage met the family at the Regional Hospital in Trondheim (now St. Olavs Hospital) in the 1990s. "From that point on, I took over monitoring this family," says Waage. He ordered new tests and investigations, but didn't get any closer to finding an answer. The researchers kept asking themselves what could be going on. At that time, a Finnish skier appeared in the medical literature. He had won several gold medals in both the world championships and the Olympics. Testing had shown him to have a hemoglobin level of 22, which could only be explained by doping. But when the Finnish doctors examined some of the skier's other family members, they found that more than 30 of them had an Hb level over 20. By now, medical methods had improved, and the researchers discovered that the erythropoietin (EPO) hormone receptor in the Finnish family had an innate mutation that caused the receptor to fire all the time, even though EPO was not bound to the receptor. This led to an overproduction of red blood cells and boosted the Hb content in the blood. This condition is congenital, and is called familial erythrocytosis. This was clearly not conscious blood doping, although the end result of high Hb is the same. For Anders Waage, the Finnish research meant that the family in Trøndelag County might finally have an answer to the riddle. "We were able to use the same methods as the Finns, and in 1998, a master's thesis was written about this case. The student looked at the EPO receptors in the Norwegian family to find out if their mutation was similar to the family in Finland," he said. "The answer was negative. The student didn't find anything and we were back at square one," said Professor Anders Sundan, who was also linked to the" blood mystery" and was responsible for this part of the study. Waage and Sundan admit they felt a bit deflated at that point. Since this was not a precarious situation for the family and affected only a few individuals, no one was pushing hard to move the research forward. There were also no new methods at that time, so what else could the researchers do but wait? In 2004, Waage attended the annual European Hematology Association conference. There, he heard Professor Radek C. Skoda from the University of Basel speak. Afterward, Waage made contact with Skoda to discuss the family from Trøndelag. Skoda took an interest in the phenomenon, and they made contact. They gathered more information over the next several years, and exchanged new data and perspectives. The methods, tests and analysis tools steadily improved over the course of the new millennium's first decade. And then 2008 brought a breakthrough. "A limited region of the genome was found to be identical in all affected members of the family. This region contained 215 genes which were sequenced. To everyone's great surprise, they found a mutation in the EPO gene," Waage said. All the family members with high Hb values had the mutation, while none of those with normal Hb values did. The finding pointed to an error in the EPO itself. The project took another hiatus after this discovery, and could have stopped altogether at this point. "We could have been satisfied with finding the mutation that causes the condition. A mutation in the EPO gene was previously unknown as a cause of familial erythrocytosis, and a new finding like this was interesting in and of itself. But one question still lingered," says Waage. "This kind of mutation is expected to cause impaired function and certainly not increased Hb values. How could this all be linked? This is what we had to find an explanation for. A possible answer was slowly maturing, but it was difficult to prove due to lack of methods—again." But in 2016, Waage received an email from Dr. Skoda in Basel; he did most of the molecular work. He reported good news. The missing method had presented as if on cue. With the advent of the CRISPR gene editing technique, it became possible to freely cut and paste DNA snippets and create new gene sequences. The first thing the researchers did was to insert the mutation into a cell that makes EPO—and sure enough, when the mutation was inserted, the cells produced 10 times as much EPO. There was no doubt that they had found the right mutation. It wasn't about some super-EPO, but rather had to do with an error that in some way led to the production of too much normal EPO. But the researchers weren't content to stop here, and wanted to delve into the complicated problem. "It's not easy to explain, but we can say that due to the mutation, a programming error occurs," says Sundan. "One of the products created on the path to EPO gets changed and becomes more efficient, which increases the production of EPO. And when there's more EPO, red blood cell production increases and we get higher Hb values." "This whole project is pretty unique," says Waage. "We're talking about slow research, where the resting phases have been longer than the phases of active research, and all the while we haven't given up. This research has been driven by curiosity for over 35 years. Four generations of affected family members have increased the number of people with elevated or normal Hb and made it easier to find a link to the mutation." He adds, "But the most important thing has to be the enormous technology advances in this period that made it possible to show that the mutation really led to elevated Hb counts." "We may wonder if a study like this has any significance beyond the family—perhaps the only one in the world—that has this mutation. Obviously, the discovery has a transfer value and can help to explain corresponding mutational changes in other diseases. It's paradoxical that a mutation, in this case the loss of a base, leads to increased production," says Wage. "It's natural to think that the opposite would happen. After 25 years, we find the mutation that is the cause of the condition and after 35 years, we can explain why the mutation leads to increased red blood production. And along the way, we've encountered a Finnish skier that we thought could give us the answer. 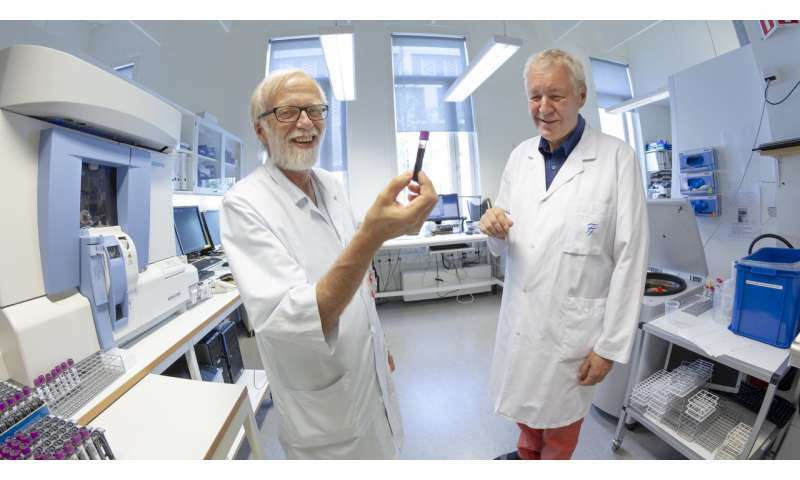 This has been an interesting and exciting journey that was finally rewarded," says Waage, who can now finally conclude the research chapter on the blood mystery from Trøndelag. For the affected family members, this mutation does not lead to illness. It's more a condition. Headaches are a common symptom, and the treatment is good, old-fashioned bloodletting. And they feel fine as soon as excess of blood is removed. Other individuals with familial erythrocytosis have a higher risk of blood clots, but this is not the case in the Norwegian family. What about their physical fitness? Strangely enough, in this case, there is a difference between whether a patient was born with high Hb levels or gained them via doping. There is no doubt that increasing the Hb level with additional EPO is very effective in increasing fitness levels. But people born with a high production of EPO and Hb like this family unfortunately don't gain a free extra fitness boost. The scientific article about this mystery was published in the New England Journal of Medicine in March 2018.